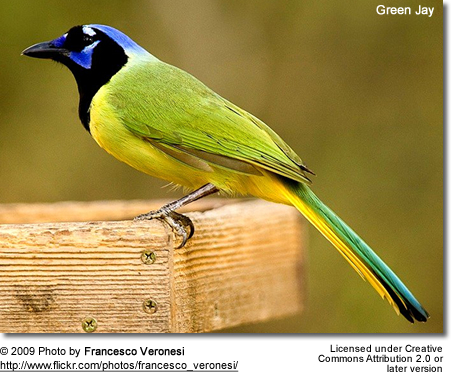 The jays are medium-sized, usually colorful and noisy species of birds that are members of the crow family Corvidae. These intelligent birds have complex social systems. 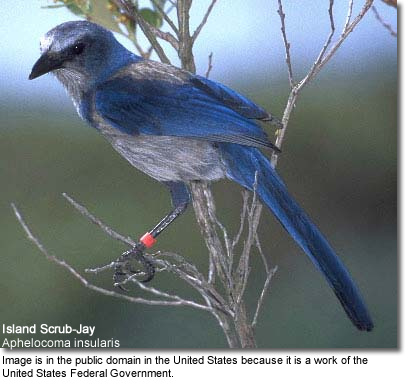 A group of jays is often referred to as a "band", "cast", "party" or "scold" of jays. 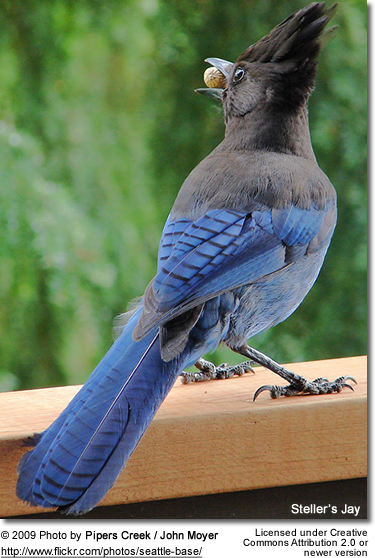 The Jay is known for its colorful appearance, aggressive behaviors, mischievous activities and strong vocalizations. Able to imitate the sounds of many other birds, they also have a seemingly endless number of whistles and calls of their own. They particularly enjoy imitated hawks and teasing owls. They derive great pleasure from expressing their extremely noisy calls and songs. 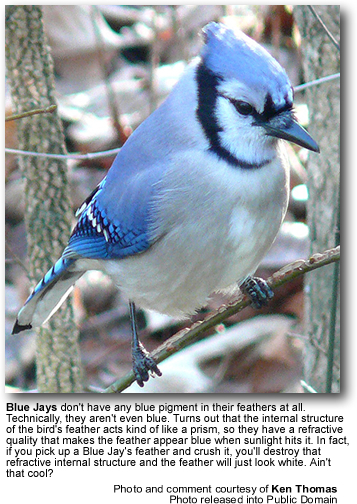 Jays vary in size from medium to large, ranging from 22 to 30 cm. 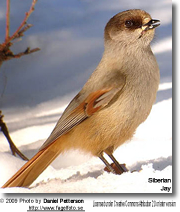 They possess short wings, a large crest and long, rounded tails. Their plumage is brilliant in its colors, ranging from shades of gray to strikingly beautiful hues of blues and purples, blacks and whites. Some species’ markings are quite spectacular, with barring around the neck. Their diet includes mice, insects, carrion, nuts, seeds and fruits. Some species also feed on spiders, snails, salamanders and tree frogs. Jays are extremely protective of their nesting sites, and will give forth an ear-splitting scream when an intruder approaches it. If that warning isn’t sufficient, they will dive-bomb the offending individual, both animal and human. Their large nests are built in trees, bushes and old buildings and are constructed from twigs, grasses, bark and leaves. Some species collect and hoard shiny, bright objects to place in the nest. 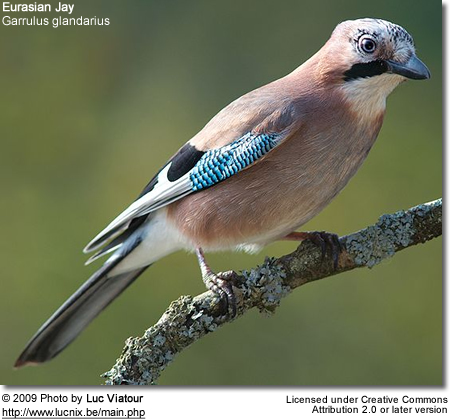 The female jay normally lays five eggs and incubates them for 17 or 18 days. The pair is monogamous, maintaining the pair bond until one dies. Lanceolated (Black-headed) Jay, Garrulus lanceolatus – Found in Afghanistan, Nepal and the Himalayas. Henderson's Ground Jay or Mongolian Ground-jay, Podoces hendersoni - Found in China, Kazakhstan and Russia. The bird is light tan with iridescent blue on its primary feathers. 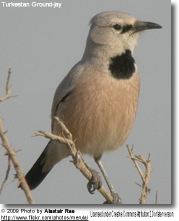 It has a long, curved beak and a black stripe on its forehead. Biddulph's Ground Jay or Xinjiang Ground-jay , Podoces biddulphi - Found in China. Piapiac, Ptilostomus afer - Found in the tropical equatorial region of central Africa from the west coast of Senegal to Sudan and southern Ethiopia. Unicolored Jay, Aphelocoma unicolor - Found in northwestern Central America and southern and southeastern Mexico, from central Honduras west to central Guerrero, southern Veracruz and extreme southern San Luis Potosi. 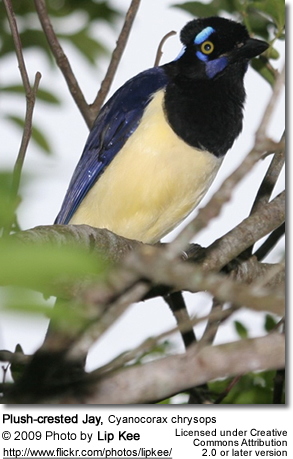 Plush-crested Jay, Cyanocorax chrysops - Found in South America, Southwestern Brazil, Bolivia, Paraguay, Uruguay, and Northeastern Argentina, including southern regions of the Amazon Basin river systems, bordering the Pantanal.